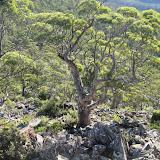 Well the weather was just ideal for a bushwalk to the Three Thumbs and to collect a few geocaches during the trip. However, the geocaching part looked a bit shaky as Peter’s GPS did not display any in the area. A later check at home showed the records were on the GPS and when overwritten with a new copy they displayed OK; puzzling! All was not lost because Adrian had notes on the caches and the grid on his GPS. This enabled us to locate the one near the cars. and also what we presumed would be the hiding placed of the "Three Thumbs Up" geocache. But when Adrian checked his GPS it indicated it was over 400 metres away on the peak previous climbed and descended from. Oh well that would have to wait for the return part of the walk. Next came the off track part and a scramble down the scree followed by a rocky but relatively scrub free walk to the high point at the western end of the ridge. Pleasant and sunny would describe then lunch spot out there and then it was back up the scree, including few gentle injury free tumbles on the wobbly rocks. Once at the saddle between the peaks, Adrian and Peter whipped up to the geocache site, soon found it and returned to join the other for the forest loop return. Peter then remembered he had left an item extracted from the cache sitting on a rock, so back up he went whilst the rest left on the forest loop. All then met up again at the other end of the loop junction. At Orford the tables and chairs were set up outside the café but a notice said closed Wednesday, and that what the day was; coffee was therefore at the Buckland roadhouse on the highway home. With coffee or for some hot chocolate finished, Shirley drove home to Oatlands, Nigel to a meeting in Hobart, whist Sue, Peter, Adrian and Peter searched the nearby church grounds for a geocache. Three more were on the agenda during the drive home. For the photo album click the image below.